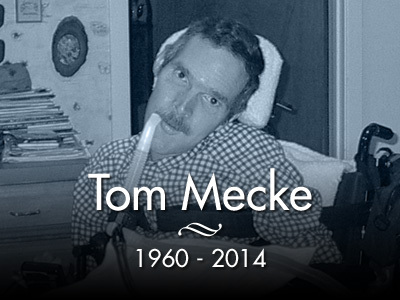 DMD Pioneers would like to take a moment to remember Tom Mecke. Tom Mecke, 54, was one of the oldest known survivors of Duchenne muscular dystrophy and a true pioneer in the way he lived. Tom sadly passed away yesterday, on the night of his wedding day. Our thoughts and prayers go out to his family and to his wife Maria. He will be greatly missed but never forgotten. I am saddened that he died, and that he did not get to spend more time with Maria. I know that she was with him before the wedding,so at least they were finally together after ten years, although for a sadly short time.